BHARTI KIRCHNER has learned to interpret Bollywood symbolism, especially when it depicts weather. Clouds are messengers of love. Strong winds represent a change of circumstances, a change of heart, possibly even a change of fortune. And monsoon showers, she adds, symbolize the rejoining after a period of separation: parched brown earth meets pouring rain; together they produce lush green jungles. As a young girl, my family and I lived in a small town in Eastern India where basic amenities such as hot water and electricity for home use were in short supply. Our town, however, boasted a single-story cinema house. It was a pastel-washed building with a huge oil-painted canvas above its marquee, which would frequently depict the hero and the heroine in garish-colored costumes. Townspeople thronged to that house to celebrate a holiday, to escape their boredom, or simply to seek refuge from the monsoon rains. Movies were a social tonic. When friends and relatives showed up at our house for chai, the conversation would start out on a casual topic, such as the exorbitant price of onions. But soon someone would mention a film, and even the dourest face would begin to shine. My mother would refer to actors and actresses by their first names—Nimmi, Premnath, Nargis—as though each were a close acquaintance. One late summer, the buzz about a blockbuster, Barsaat, or The Monsoon, shot through our neighborhood. The 1949 film had made its rounds elsewhere already, but not in our little spot. It had been directed and starred in by Bollywood’s most dashing actor of the time, Raj Kapoor. What an appropriate movie title, I thought. We had been experiencing searing heat for days. The roads were covered with dust. The water in the pond by our house had nearly evaporated. Monsoon would surely soon be upon us, we hoped. This film might do the trick. Crushed, I stood and watched, as Mother dressed herself in a blue sari, an emerald necklace, and a stack of clinking gold bangles. She looked beautiful, like a movie star. As she checked and rechecked herself in the mirror, her friend knocked at the door and I answered. She was attired in a gleaming white sari which dazzled even in the dim light of the kerosene lamp. How nice it must be to be an adult, to feel the smoothness of silk and cool hardness of gold next to your skin, and wander over to a fantasyland. Mother must have noticed my glum face. “I’ll tell you the story, I promise,” she said as she slipped out the door. It was a rare opportunity for her to forget about us kids for a while. And with uncles, aunts, and my father at home to take care of us, she didn’t need to worry. My sister and I played Snakes and Ladders for a while. Then I drifted off to a restless sleep, the humidity pressing down on me, only to dream about going to the cinema. The next morning, I woke to a new song Mother was singing, full-throated: “My sheer red scarf floating in the wind.” Though the words conjured a playful feeling, I detected a note of poignancy in her voice. She was fully into the song—this stoic woman who rarely showed her deepest feelings. Throughout the day at school, I remained restless, curiosity about the movie plot blazing in my mind. By afternoon, the wind hissed, dust in the air suffocated breathing, and thunder rumbled, although no rain was in sight yet. I got home alright. At four o’clock, teatime, I slid onto a kitchen stool, happy to be inside and even happier to be alone with Mother. She served me khirer luchi—tender crepes steeped in cardamom-enriched thickened milk. She must have spent hours on this delicious dessert—kneading the dough and reducing rich milk to desired thickness—a dish usually served only during holidays. I could only assume she’d neglected washing clothes and sweeping the floors to make time for this special treat. As I took a piece of luchi into my mouth and savored its moist sweetness, I slipped into the light, airy, dreamy state Mother must have been in all day. Lightning flashed outside and the wind began to howl. Quickly I reviewed the facts repeated in the classroom around this time: moisture-rich air from the Bay of Bengal collided with the Himalayan Mountain range in the north to bring heavy rain and high humidity. There was an edgy anticipation about the season, among the farmers for sure, but also among the general public. Tempers rose and grievances got more serious. Even the peacocks in their agitation spread their tails more flamboyantly, or so my teacher had insisted. Mother took her seat, cheeks blushing, her face animated. She showed nothing of the pre-monsoon jitters that adults were supposed to suffer. As she filled her cup, lazy, wispy tendrils of fragrant steam curled out of the amber chai. The windows were dark, the room cool, the atmosphere just right for a story to unfold. “There is this poet, who is gentle and sensitive,” Mother finally began. “He and his friend start driving and together they tear through the Vale of Kashmir.” While she paused to sip her tea, I imagined the setting: snowy mountains, lush valleys, and crystalline waterfalls, such a contrast from the plains where we lived. I pictured the maiden: sad-eyed, aged about sixteen years, her long hair plaited into braids, elaborate pearl earrings touching her shoulders. She leaned out the window, eager and uncertain, causing feelings of sympathy to rise in me. Rain hammered our corrugated roof in a cacophony that drowned out Mother’s reply. There was a knock at the door, she rose to answer it and I followed her. Uncle Bhusan slipped in, his shoes wet and muddy, his umbrella broken, and he cursed the weather under his breath. Of medium height and stocky, he had a solemn expression on his face. Mother busied herself retrieving a towel, while calming him with her gentle words. Then she bustled off to make another pot of chai. In the lull, I listened to the drumbeat of the rain, which sounded like a command to stay indoors. Sitting in the kitchen and polishing off the remains of my luchi, I listened to the conversation in the living room. “What weather,” Uncle Bhusan said. With them bantering about the monsoon and the gods, I never did learn the film’s ending. In my youthful fantasy, I imagined the scene of the marriage ceremony. Women wore rainbow-colored clothing, ornaments flashing from their necks, ears, and feet. Men, too, dressed in their finest tunics and trousers, a bright sash at their waists. Trumpets played, marigold petals were strewn everywhere, and platters of rainbow-colored sweets were distributed. Then the dead person—a pretty, young woman—came back to life by some magic and showed up in shimmering new silk. “My daughter is back,” her teary-eyed mother said, hugging her. The families rejoiced and an impromptu second wedding took place. The poet—our good guy—got the bride he wished for, I assumed, and the lonely maiden got her man back, all because of the sheer force of her love. I tucked away all these details, determined to see the film some day and compare the real ending to my imagined one. Time passed, numerous other films opened in our town’s theater and every so often Mother would stroll to the cinema house with her friend. At home, however, she often hummed the “red scarf and wind” tune, a faraway look in her eyes, especially when it rained. What did she get out of that film and the song? Was it simply an exotic escape from her humdrum existence or did it speak to her at an intimate level? Might it be the association with the elements that had bonded her to the story? I couldn’t ask. I didn’t want to break through the shell of privacy she had created around her. I wanted the plot to be hers, the scenes treasured and relived in her private moments. Nonetheless, each year when the monsoon season arrived, I tried to figure out the role of rain in the storyline of Barsaat. What held the secret of success to that blockbuster? What triggered Mother’s longings? Years later, living in the U.S., I would occasionally rent Bollywood DVDs and get swept up by the energy, colors, costumes, and glamour. I’d fantasize that I had returned to India, to the nondescript town of my youth, the high wind, Mother’s khirer luchi, and her storytelling. 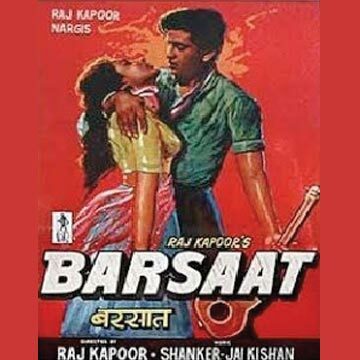 Old classics such as Barsaat weren’t yet available in the DVD format. Another guest walked in, interrupted our conversation and I never got a reply. Two new movies also titled Barsaat, but depicting different story lines, appeared on the screens in 1995 and 2005. Still the Barsaat of my childhood kept haunting me, the way an unsolved murder mystery might haunt a detective. Each time I went home to visit Mother, we would talk about the old days, but I never asked her about that film. It didn’t seem appropriate to try to sort through feelings so personal to her. The timing didn’t seem right, either. Maybe next time, I’d say to myself. But next time never came and my mother has since passed. Now that I live in Seattle, where it also rains copiously, I have ample time to watch movies. 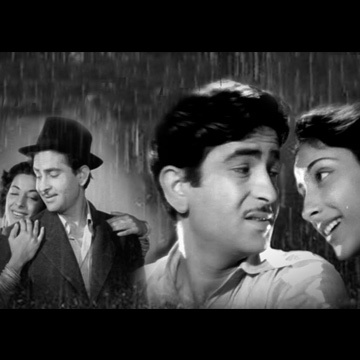 Like many other Bollywood classics, Raj Kapoor’s Barsaat has been digitally mastered and is readily available. I could even watch it on my laptop. But something always causes me to stop and ponder. The film might prove disappointing. The lyrics might sound dated. The ending I’d imagined might not be there. Bharti Kirchner’s novels include Shiva Dancing, Darjeeling, Sharmila’s Book, Goddess of Fire, and she has also written four nonfiction books. The Seattle-based author’s latest mystery novel is called Season of Sacrifice.